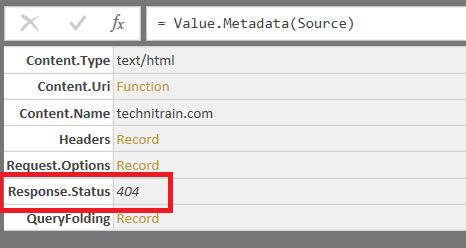 One strange feature of the Web.Contents() function in Power Query and Power BI is that it doesn’t respond in a consistent way to the standard error handling techniques used in M. I don’t know if this is a bug or a feature, but it’s certainly something I’ve run into a few times so I thought I would share a description of the problem and a way of working around it. The ManualStatusHandling option takes a list of numeric HTTP error codes, and if you run the above example you’ll see that the query no longer returns an error. Great job Chris. Quick question, while still on the Web.Contents function. Have you worked on scenarios where you require OAUTH 2 authentication (with anonymous login). And more importantly how to build M code to automatically renew the access_tokens for calls to Twitter Analytics API, Facebook’s Graph API and Linked In’s API? Power BI/Power Query doesn’t handle OAUTH2 nicely yet. If you google you’ll find some examples of how to do it, but honestly my recommendation is not to try until the official support is available. An M binary value can be thought of as a Func in C# terms, if that helps. When you invoke File.Contents or Web.Contents, you don’t actually get the contents of the file or URL; you get a pointer to the contents. As long as no one looks at any of the bytes, we don’t actually try to access the data. Functions like Xml.Document or Json.Document actually need the bytes, so they force the data to be loaded. Just starting to use Power BI and have come across your article. I have replicated your code but in some cases 200 is coming back when it should be 404. Maybe something to do with the caching that Power BI does? I would try adding the IsRetry=true option (see Curt’s comment on this post https://blog.crossjoin.co.uk/2017/01/06/web-contents-caching-and-the-excludedfromcachekey-option-in-power-bi-and-power-query/) to ensure that no caching takes place. Expression.Error: 3 arguments were passed to function which expects between 1 and 2. Quick question: I’m trying to use the metadata to determine the response code first before accessing the response body. However, this seems to trigger 2 http queries(1 from the metadata, the other from trying to access the response), it’s probably to do with the way how execution tree are evaluated in M. Are you seeing the same thing happening, and is there are good way to avoid the repeated queries?